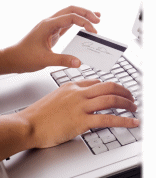 Gift cards may be purchased in the system and paid for by cash, check, or credit card. Optionally, a guest profile may be assigned to the card. A detailed activity history is kept per card including the beginning and ending balance. Gift cards may be partially or fully redeemed at any Hotel front desk or Execu/Touch POS outlet. They may even be used for reservation advance deposits. No card may be redeemed unless it has a sufficient balance. Gift card / Gift Certificate system fully integrated into HOTEL and Execu/Touch. Automatic postings in master folio. Each gift certificate/card can be tracked. Customer support is such a high priority at Execu/Tech that we gave it a special name- Execu/Care. We think the name reflects the attitude we have toward each and every customer. We care about their success. Their success is our success. The majority of incidents from Execu/Care customers are handled immediately. We use real people to take your messages and have technicians on staff 7 days a week, 24 hours a day. Hardware, system, and networking requirements are provided in advance by Execu/Tech for your IT professional so that your Execu/Tech solution will run fully optimized. On-site installation and remote installation by competent, experienced Execu/Tech professionals assures you that everything is installed and running correctly. On-site training by Execu/Tech professionals assures you of thorough, hands-on, face to face instruction in all areas from data setup to end user application. Live, on-line remote training is a sensible option that can be paired with on-site training with setup will be done over an extended period of time or when new staff is hired and needs to be trained by an Execu/Tech professional. 24-hour support seven days a week at a fair and reasonable cost will give you the comfort of knowing that Execu/Tech staff will be available when you need them. is packed with features designed with the guest in mind. Guests’ dietary restrictions may be entered with their reservation and are accessible from the point of taking the reservations all the way through their dining experience. Never worry about whether or not a guest is allergic to something you are serving that evening. 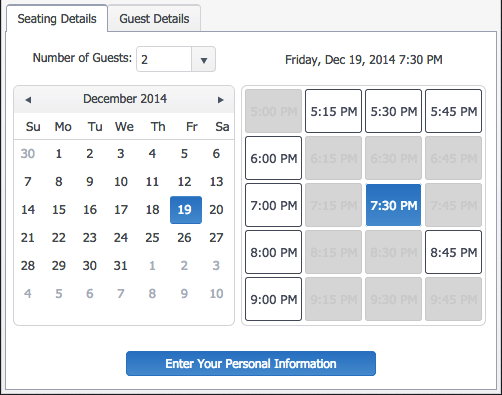 With Execu/Tech’s Dining Reservations, all the guest’s information is just one click away. Guest dining preferences can be included in Guest Profile and printed on the kitchen chit with the guest’s order. Guest name selection from Guest Profile will indicate if this is a walk-in dinner reservation or an in-house hotel guest. Tables can be set aside for pre-specified time slots. 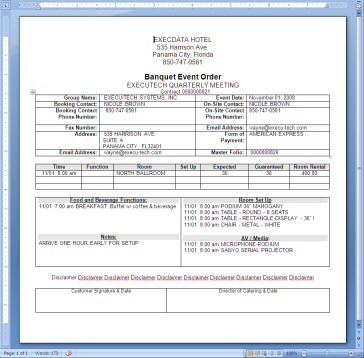 Guests can be assigned specific tables for specific time slots. Staff such as an expeditor can set mood rating 1-10. The mood rating prompt will display at each change such as seating, appetizer, fire. A mood rating below 6 will prompt a chit to print to the kitchen. Tables will change color as guest enters, each course is walked, guest has departed and table is ready for next guest. Guest preferences, traces, special dietary restrictions, and special order forms can be printed by date or date range. Host your own online booking page. Real time availability and seating assignments. The Execu/Touch dinner reservations system has a built-in daily seating availably chart that is customizable for each day. Finally you will have the ability to specify when you want a table to be reserved and when you don’t. Our system is designed to allow your manager to guide your reservationists to assign the exact table to obtain maximum occupancy without worrying about overbooking. The ultimate in guest management is here! Our Dinner Reservations package has an integrated guest profile system. This system allows you to save demographical information on your guest as well as dining preferences that will be linked to future reservations. Our daily reservation report gives you all the information your hostess needs for seating. It includes guest name and phone number, reservation time, reservations notes, and flags as to whether the guest has Dietary Restrictions and if this visit is a special event. Know that you can depend on timely and reliable financial reports with Execu/Tech’s Back Office software. 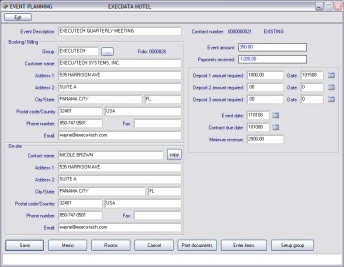 Fully integrated to other Execu/Tech programs, Back Office will save you and your staff the drudgery of making daily general ledger manual postings to reflect your income, liabilities, and receipts. There’s no need for you to purchase a separate accounting system from another vendor when Execu/Tech Systems offers a full accounting system developed by accountants who know the hospitality industry. Special room look-up in reservations by room usage, assuring even distribution of rentals to all owners. We give you the tools you need to make sure every group’s requests are taken care of. You designate departments from catering to valet to sales to housekeeping and print the information each department needs to keep everything on track. 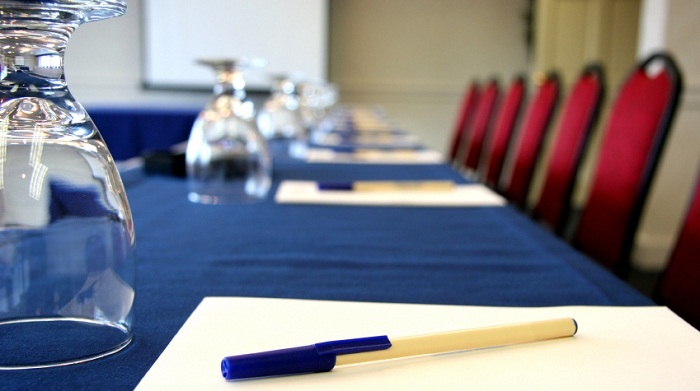 Fully integrated to Execu/Suite Hotel Management System, Catering / Event Management provides seamless and effortless management of your facility’s conference rooms, events, and group functions. Each step is easy and effortless. Weddings, Receptions, Reunions, Conferences, Seminars, Meetings, Luncheons. Sports, Arts and Entertainment, Education, Corporate, Families or any group! No third-party services required. We do it all. Manage your own templates and campaigns, or we can do it for you for a fee. Seamless PMS Guest Profile integration. No uploading. With Execu/Suite Spa/ Activities, you can build a profile for each guest, maintain preferences of specific treatments or special needs. With Execu/Suite Property Management integration, your hotel reservationists can enter names of guests who would like to schedule on-site activities or spa appointments, creating one profile that serves both Execu/Tech Property Management and Activities. With Execu/Touch POS integration, you can sell products and services, post charges to guests’ rooms, and print receipts. Easy setup lets you define the activity or treatment, room or location, and staff or vendor schedules. Set up activity-specific queries such as guest height, age, etc. 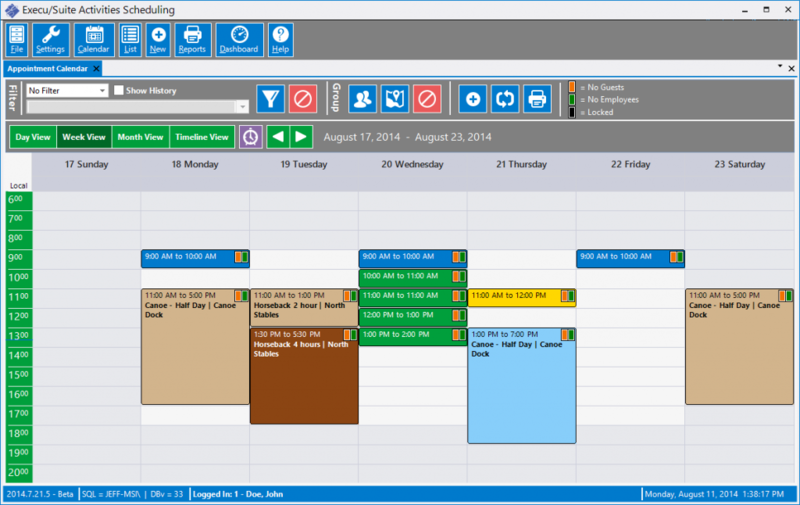 Then let Execu/Spa manage your calendar and even your commission reports. Scheduling couldn’t be easier. Execu/Suite Activities is essential to managing the details that come with a full-service resort property. Execu/Spa takes the worry out of booking and scheduling. Contact us for a live demonstration!